If you have a preservation on a Fannie Mae property with multiple bidding vendors, Broker Brain can now generate Brokers Scope of Repair forms for all vendors simultaneously. Before you can proceed with these instructions, you must first create the preservation with NO vendor bids attached. Click here for information on how to do this. 1. Locate the preservation for which you wish to add the form. Click the + next to the preservation name to open it. 3. Click the + next to Add New Form. 4. 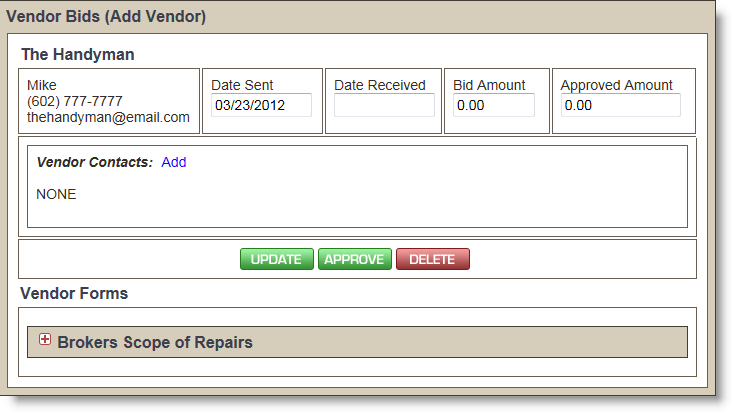 From the Form Type drop-down box, select Brokers Scope of Repairs and click the green Add button. If you do not see the Brokers Scope of Repairs in the form list, you need to change the Form Set assigned to your Fannie Mae properties. For information on assigning Form Sets, see Clients. a. DO NOT complete the Contractor information at the top of the form. Since you are generating multiple forms at once, if you add this information, it will be incorrect on all of your forms. Broker Brain will fill in this information for each vendor as the forms are created. Note: Broker Brain pulls the contractor information from the data you entered into the system. If this information does not appear on the BSOR, you need to add information for the contact under Admin>Vendors. b. Type the necessary repair information in the appropriate spaces of the form. d. Click the drop down arrow next to Choose... and select a bid type. This will narrow your vendor list down based on the type of work they do, and will display a list of available vendors. 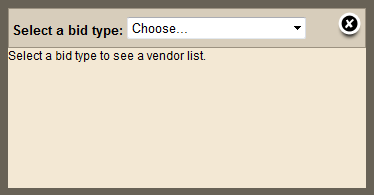 Select each bidding vendor and click the X in the upper right corner to close the dialog box. e. When the form is completed, scroll down to the bottom of the screen. If you wish to save the form but not yet generate the vendor bids, ensure that the drop-down arrow above the green SAVE button reads Save Changes, as shown below, then click the SAVE button. If you are ready to generate your vendor bids, click the the Save Changes drop-down arrow and select Save and Create Bids, followed by the green SAVE button beneath. This action will do three things: 1) save your form, 2) create vendor bids for each vendor you specified, and 3) generate a Brokers Scope of Repairs form for each bidding vendor. 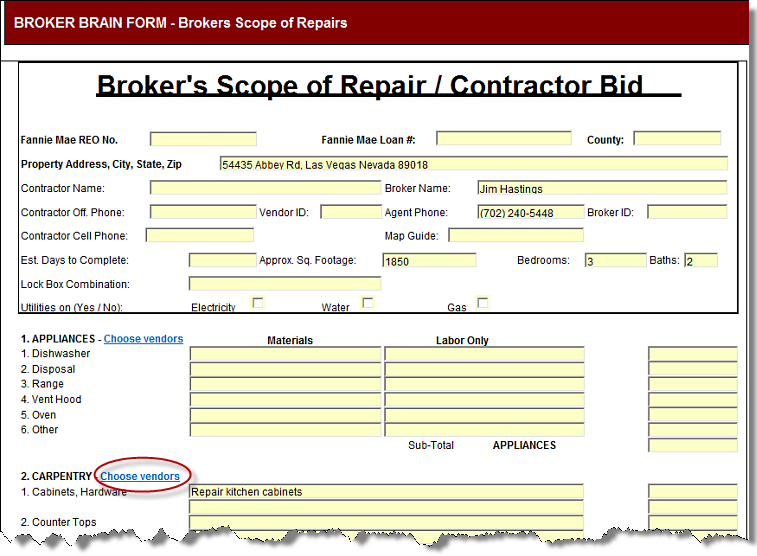 Each vendor you specified in the Brokers Scope of Repairs will appear in their own pane. In the Vendor Forms section beneath each vendor, you will see the Brokers Scope of Repairs form that was generated for each. 9. Click the EMAIL button and follow the process to send an email. You do not need to add the form as an attachment. That will be done automatically. A record of the email will be kept under Notes in the Vendor Forms section of each vendor bid (below the Edit, Email, Download buttons), with the form shown as an attachment. To Delete a form, click the red Delete button beneath the form and select YES in the confirmation dialog box. Click the Download button if you wish to save a copy of a form on your computer. 1. Open the preservation and click the + next to the preservation name to expand it. 2. Click on the Forms sub tab. 4. Click the green Edit button. 5. Make the desired changes to the form. 6. Scroll down to the bottom of the screen. Click the the Save Changes drop-down arrow and select Save and Create Bids, followed by the green SAVE button beneath.